Specializing in corn-fed beef and an extensive wine list, this steakhouse chain appeals to business diners. : Fleming's Prime Steakhouse & Wine Bar is a sizeable restaurant chain from Paul Fleming, the man whose initials can be found in another of his creations, P.F. Chang’s. This branch is one of the many eateries at L.A. Live, the 27-acre mixed use development downtown that includes the NOKIA Theatre, just across the street from Staples Center and the Los Angeles Convention Center. The patio is on the heavily-trafficked corner of Figueroa and Olympic. The long wooden bar inside is much more inviting, and makes a convenient stop for post-office mingling or pre-game imbibing. In front of the open kitchen in the cavernous space are plenty of medium woods and banquettes to give the place a contemporary feel, as well as a small private dining room with see-through walls. 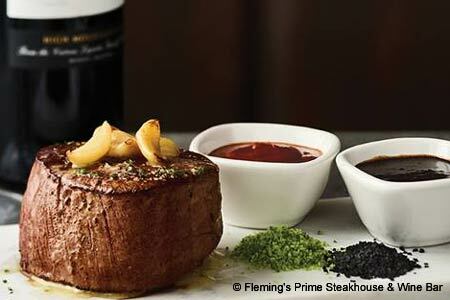 The steakhouse chain distinguishes itself with an extensive wine list, with more than 100 selections served by the glass, known as the Fleming’s 100. Much of the décor features large photographs of wine or actual bottles stored in the wooden walls. As the name suggests, the restaurant offers tasty Prime beef, and also salads, seafood and other steakhouse staples from a standardized menu prepared simply by chef Calvin Holladay. Happily, they have enough confidence in their product not to push sauces for the steaks, but will provide a few upon request. Satisfying sides tend to be decadent, such as the signature potatoes made with cream, jalapeños and cheddar; three kinds of mashed potatoes; and chipotle cheddar macaroni and cheese. For dessert, consider the chocolate lava cake.